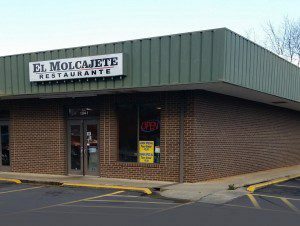 El Molcajete is Rock Hill, SC’s newest Mexican restaurant. We specialize in authentic dishes that will give you and your family a true taste of the culture of Mexico. Our menu features items you simply won’t find at any other Mexican restaurant in town. Tortas, or Mexican sandwiches, are one of our most popular items. Choose from seven different meats, each topped with an assortment of fresh vegetables and served on delicious bread. Our taco selection includes specialty fillings like beef tongue and chitterlings, as well as more familiar meats like chicken, beef, steak, pork, and sausage. If you’d like to sample several different foods, try one of our combination platters. These include a variety of unique foods alongside traditional favorites like tacos, enchiladas, burritos, fajitas, and chimichangas. The Molcajete platter is one of our most authentic dishes. It includes grilled steak and chicken, shrimp, chorizo sausage, and prickly pear. We offer a children’s menu for the youngest members of your family. Lunch specials are also available every day from 11AM to 3PM. However, you’ll find that everything we serve is very affordable. We offer beer and wine for your enjoyment, including a selection of Mexican and domestic beers. If you want to try a something a little different, order our homemade micheladas or sangria. Our friendly staff is one reason why we’ve quickly become a favorite place to eat. You’ll be greeted with a smile and your food will be prepared fresh to order. If you have any questions about anything on the menu, just ask! We’ll be happy to talk to you about a dish’s ingredients or make a recommendation. Visit El Molcajete for delicious Mexican food. Our family-owned restaurant is open seven days a week and is conveniently located just off Cherry Road. Takeout orders are welcome.